James Eaton, president of Little Harbor Window Co., discusses some of the strategies his company used to implement lean production processes. 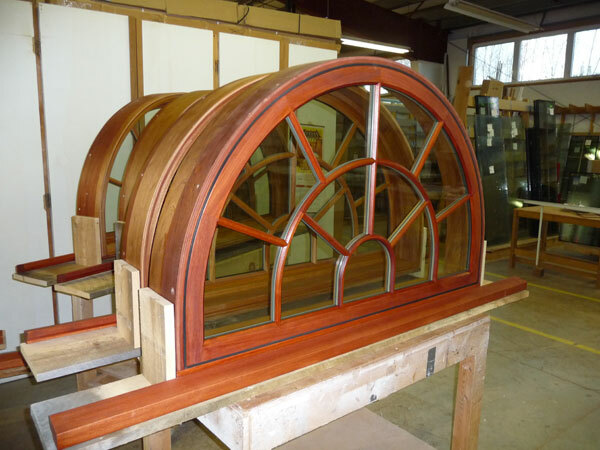 Pictured above is one of Little Harbor Window Co.'s projects in production. The company used the lean manufacturing process to reduce its typical job cycle time by more than half. In 2006 Little Harbor Window Co.âs gross income hadnât seen significant increases in three years. Although sales could be increased, production would not be able to keep pace, so the Berwick, ME-based window and door manufacturer decided to get lean to add capacity, says James Eaton, president of the company. Since it began making changes to the machinery and production flow, job cycles have dropped drastically and the company has seen a variety of other benefits. Below are four ways your company can use some of Little Harbor's strategies to get lean and reduce job cycle times at your shop. One way to get the consulting help you need from lean experts is through government offices and educators. For Little Harbor, the immersion in the lean process began with a call to the Manufacturing Extension Partnership (MEP), a government office dedicated to increasing the competitiveness of the United States industrial base. After calling, the company discovered it was eligible for a $40,000 federal grant to cover MEPâs lean consulting work. Eaton advises that another good resource for reasonably priced lean consulting is the university system, where graduate students and professors are often eager to help to gain real world learning opportunities. Little Harborâs lean process began with two MEP consultants putting on an exercise at the shop involving every employee, including management, designers, production personnel and administrators. Following the demonstration, the entire company trained with MEP to understand basic lean concepts, and a lean team was created with members of each department. One of the first, and most important steps the team took was creating a Value Stream Map, Eaton says. The map clearly pointed out changes the company needed to make to improve efficiency, including moving entire departments to enable an easier sharing of resources and improve production flow. The resulting layout also saved the company a lot of space, Eaton says. Another step the company has taken in its continually improving process is using a 5S exercise to reorganize and standardize workstations. Part of the standardization was placing shadow boards behind benches with outlines of where each tool should be placed. This prevents tools from being misplaced or hoarded, because the tool outlines remind production personnel to replace them after use. As part of the lean process, Little Harbor embraced quick changeover machinery, which has allowed them to work more efficiently with smaller batch sizes, and easily rework damaged products. He adds that the software that came with and runs the Busellato router, which is called Genesis Evolution, has also made setting up jobs more efficient because it is parametrically driven. This allows him to program cuts, then easily adjust them according to the size of the board being cut, Eaton says. Although the companyâs production process has improved since embarking on its quest for lean, more projects are in the works. Eaton says Little Harbor has hired MEP to embark on production documentation work, as well as redeveloping scheduling, and dropping tracking throughout the shop.